Let’s Make Sure Everything is a Thing 7″ Debut solo release. Let’s Make Sure Everything is a Thing b/w Girls Collide. 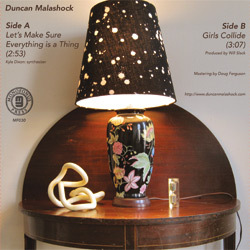 On his 7-inch release on Monofonus Press, which includes the goth-glam guitar pop “Let’s Make Sure Everything Is A Thing” and the cavernous avant-disco “Girls Collide”, Malashock blends less-is-more techniques into more-is-more compositions, while managing to avoid the simplistic.